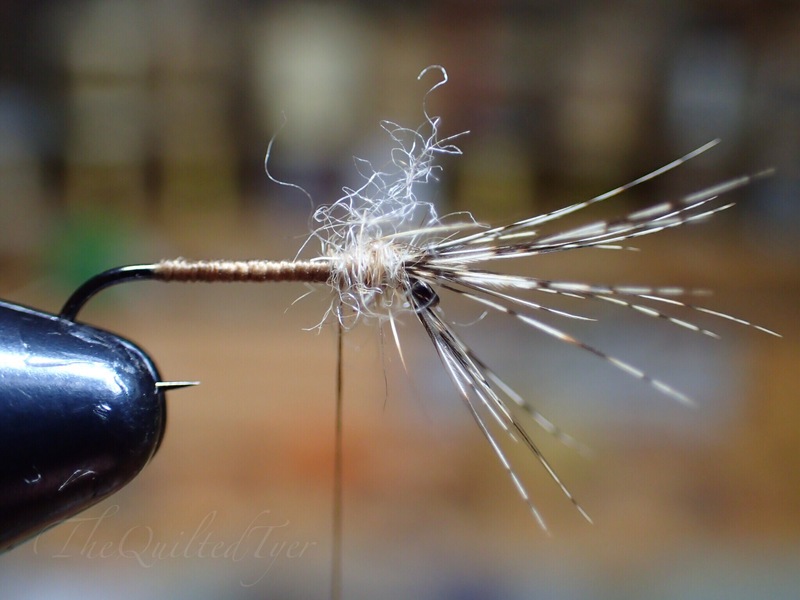 Anyone who has spoken to me during a presentation, while tying at a show or on the water, knows that I love tying, fishing and talking; soft hackles. If they didn’t know it at first, they learn rather quickly, seeing as though my caffeine fueled ramblings have a tendency to veer in that direction mid conversation without warning. It’s an addiction! So much so, that in the middle of tying something else, I seem to glance over to where I had previously left a partridge or starling skin, look left and right like I am doing something wrong, abandon my current pattern and move over to my husbands vise! Tie one or two, and then hop back over to my side and continue what I was doing. Oh what a great addiction to have! 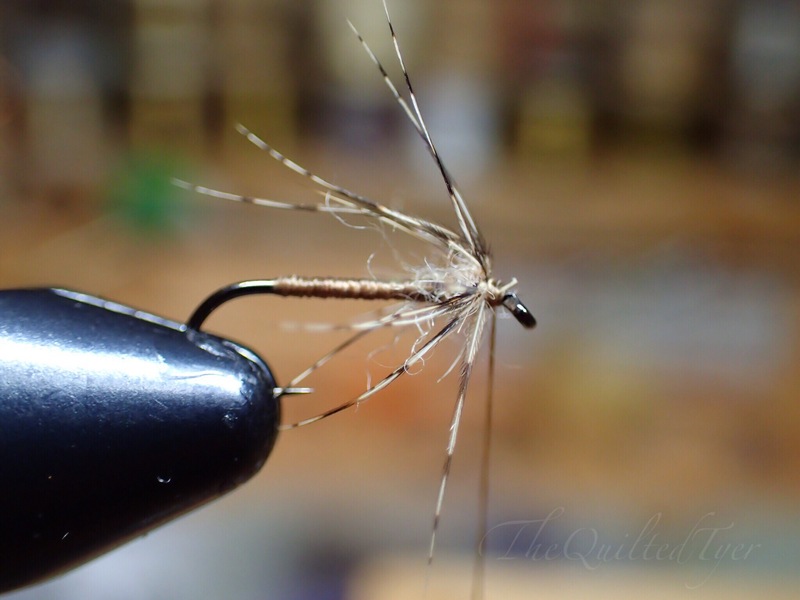 The other side to this, is that no matter how much I love tying and admiring a handful soft hackles where everything is seemingly perfect, doing everything I can to recreate the fly to my liking and bettering myself at the techniques; the bottom line is that soft hackles fish just as good on a first cast as they do after 5 fish. The more chewed up the better they become! The fibers are all over the place, floss is frayed and you’re still hooking fish with the lifelike appearance that they give, even with those materials all askew! 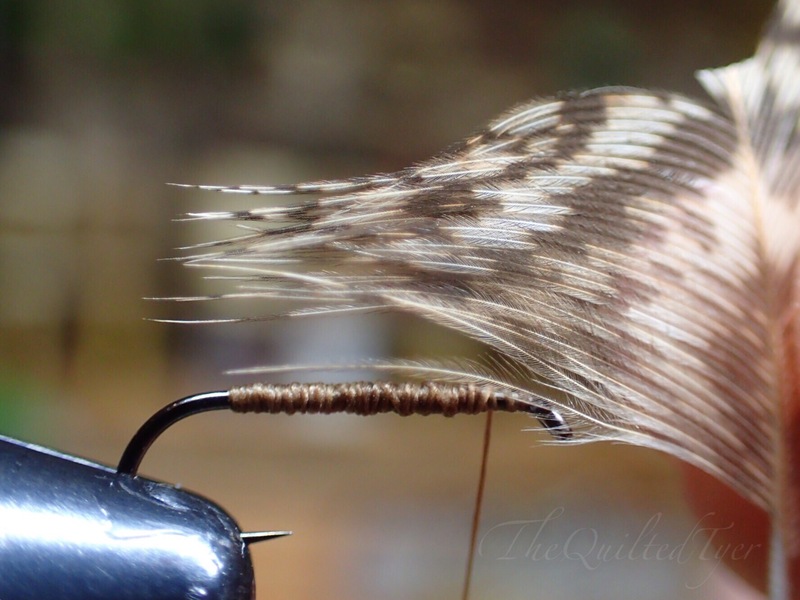 Soft Hackles: They fish just as well after 5 fish as they do right off the vise. 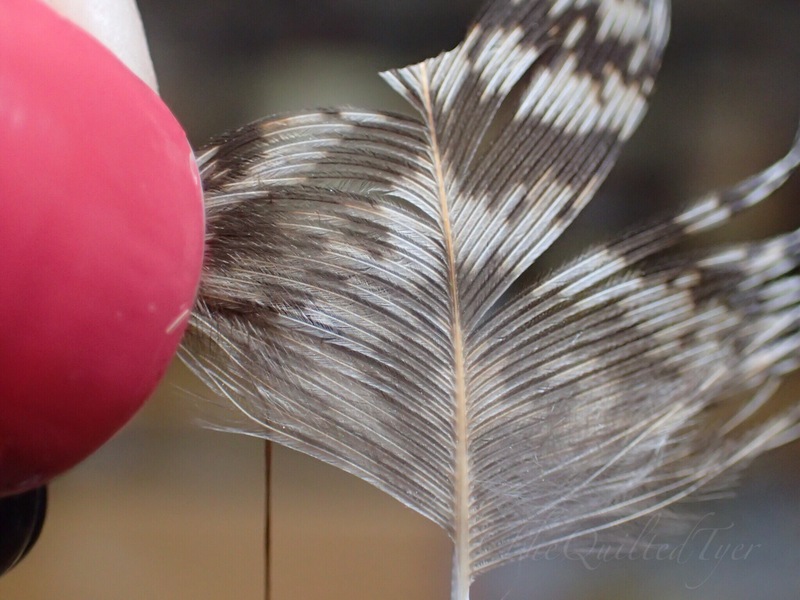 A while ago I put up a step by step on how to wrap a soft hackle, and the same way in which that will teach you how to achieve the effect you are looking for, by using the correct size feathers; this will teach you how to do it without them. The truth is that our material stash may not always yield what we need at the time that we need it to the most. Sometimes we are traveling to fish, and even though we did our best to pack a little material to replenish our boxes on vacation should the need arise, we may soon realize that we accidentally grabbed the skin with the sweet spot picked clean. Just as quickly as the “money throwing, material hoarding excitement” gets the better of us when it comes to shopping (clearly… more than once) and we can splurge wayyyyy to excessively on materials in one impulsive shot, those times are few and far between. Money isn’t always there, and we aren’t all in the position to frivolously spend what we don’t have on new materials. So why not try to utilize what we do have? 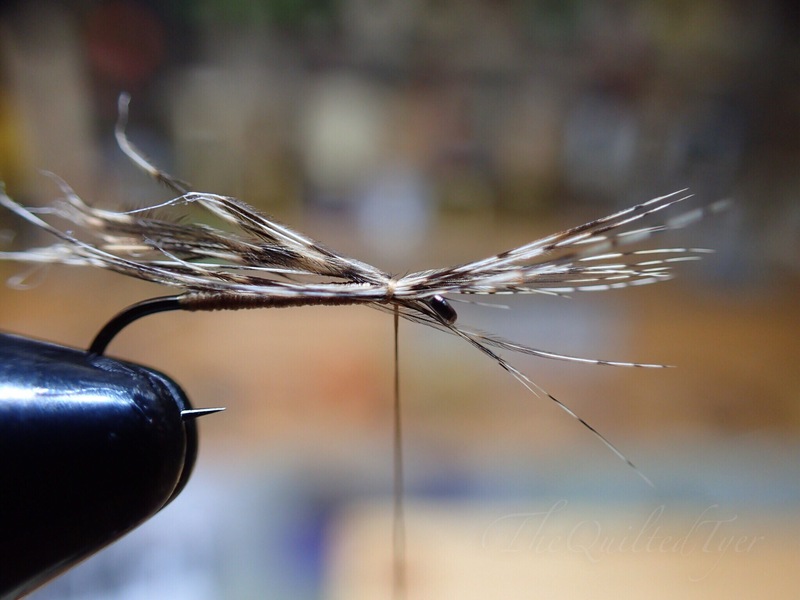 If you have ever found yourself in the mood to tie some soft hackles, and the next thing you know, you are left with too much hackle and too little hook.. and no idea what to do? There are many ways to do this so I will be splitting it up into a few posts, by demonstrating two techniques at a time. Keep picking! This skin is farrrr from finished!! As you pick the sweet spots out of a soft hackle skin, taking the time to size them up correctly, but only using the exact ones needed. eventually you will be left with feathers that are simply too big. 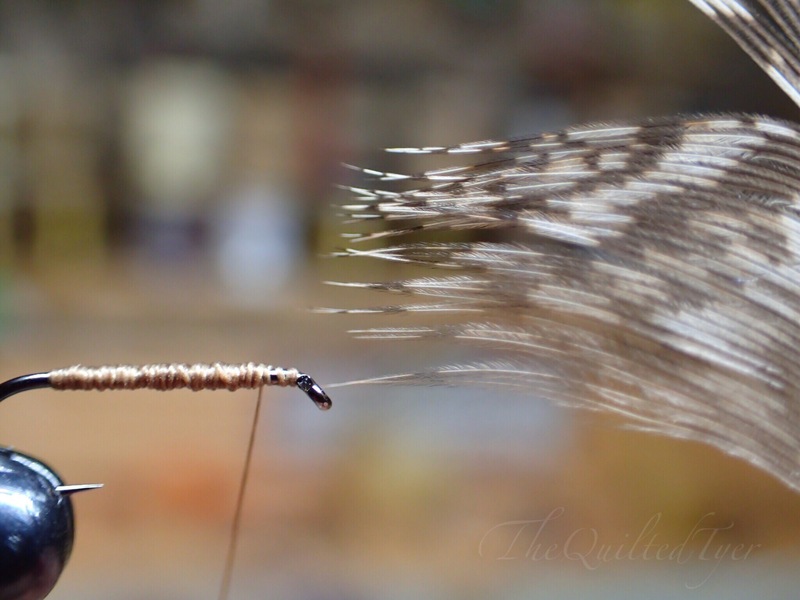 These following tutorials do not give a complete fly pattern, it just gives you different ways to utilize bigger feathers on a smaller hook. I am tying everything on a size 16 so you have a reference. It will be up to you to decide which techniques will work the best, as I am only giving suggestions. 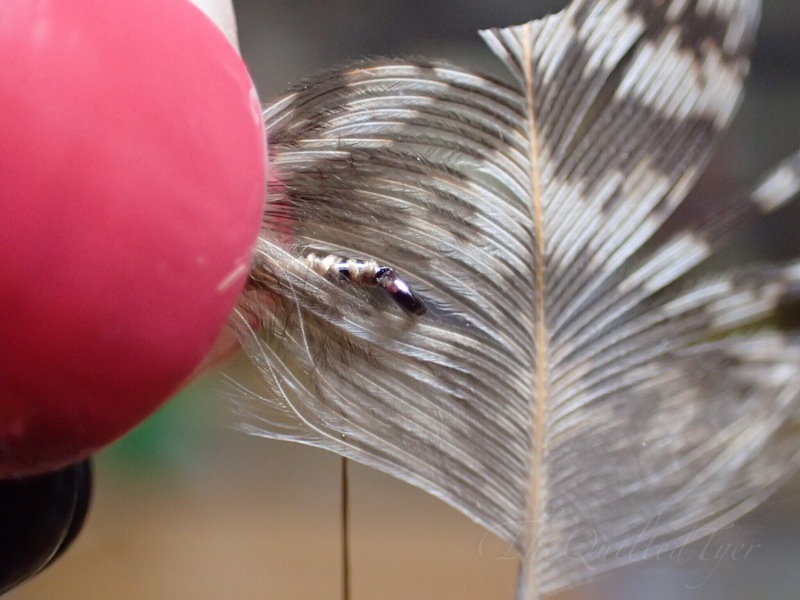 And If this is your first time, I recommend just using a bare hook, grabbing some large feathers and having fun experimenting with these new techniques, before applying them to your fly tying. 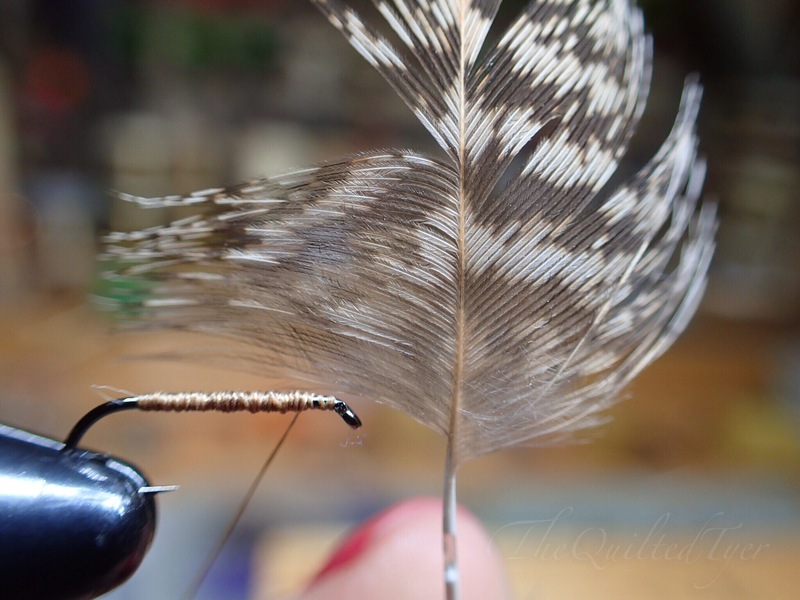 Begin with a base of thread on your hook and an oversized partridge feather. If you are out of partridge, then just grab whatever you have. 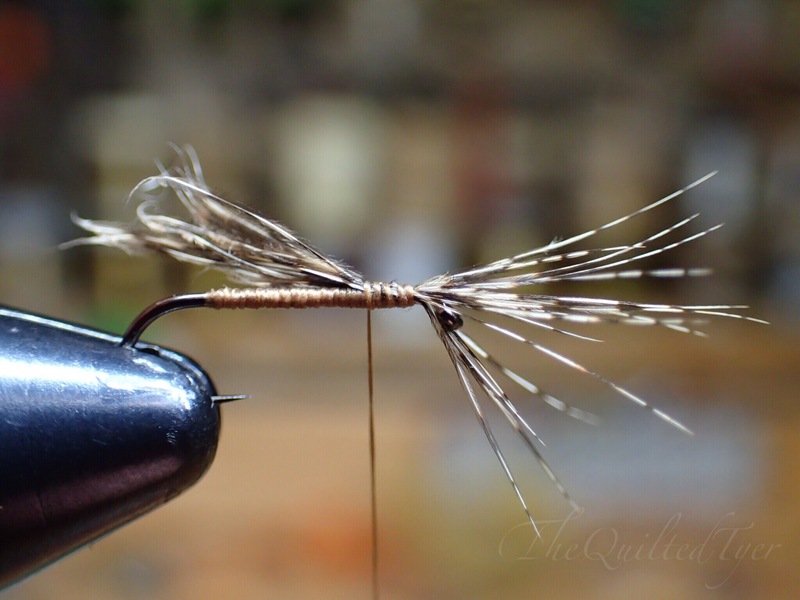 You might be used to tying soft hackles by either the base of the stem or the tip of the feather, but today its a little different. 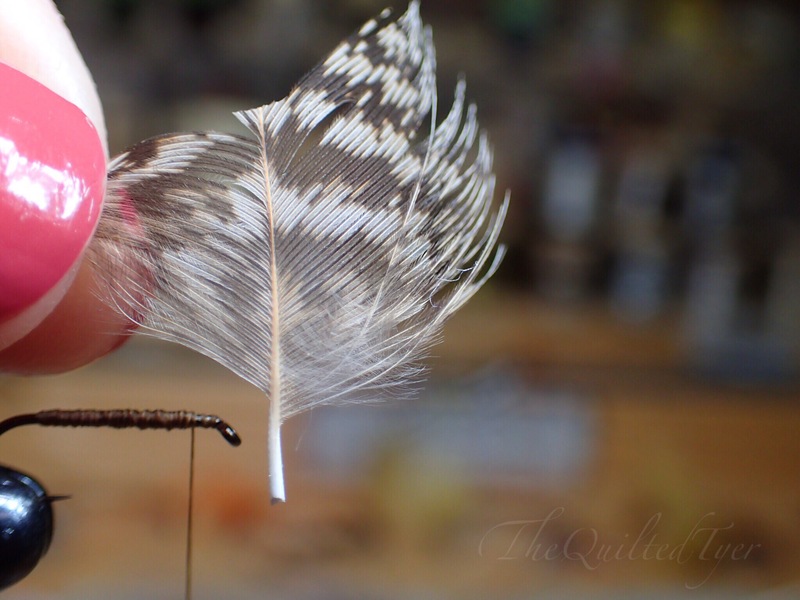 Once you have decided that the feather is too long to be used normally, hold it vertical by the stem and preen the fibers on one side of the feather, horizontally over the hook shank. 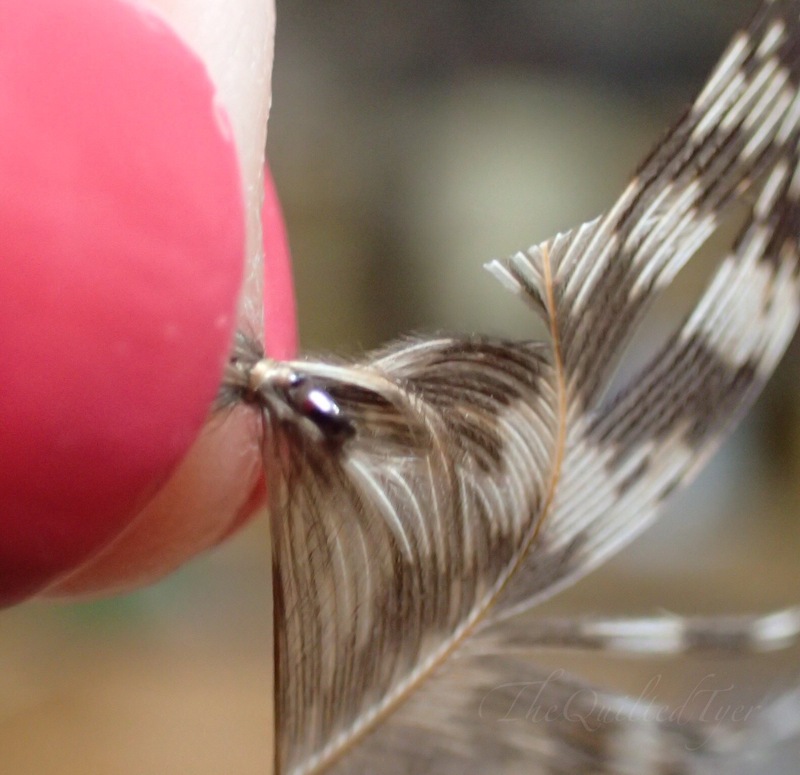 Use your fingers to smooth out the fibers on the side of the feather and hold them horizontally over the hook shank. 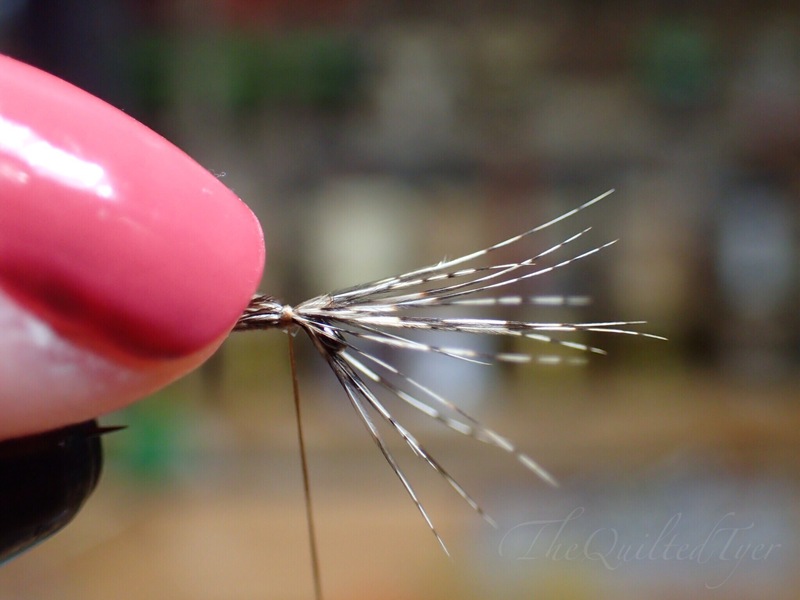 Doing this will give you a general idea on how many usable fibers you have, and if it will be enough for your fly. Deciding this part will be up to you, and will get easier with practice. But to give you a general idea on how to tell, look at the photo above. Now Grab that bunch of fibers over the shank..
And Take a quick look to make sure that the majority of these fibers have even tips.. If the majority of those tips aligns? Tear them off. Now pull them in a clump right from the stem. Once you are holding the bunch of stripped fibers in your hand, you want to move them to whichever hand you normally use, (left handed or right) in order to have the tips facing over the eye so you can measure and tie them in with a pinch wrap. 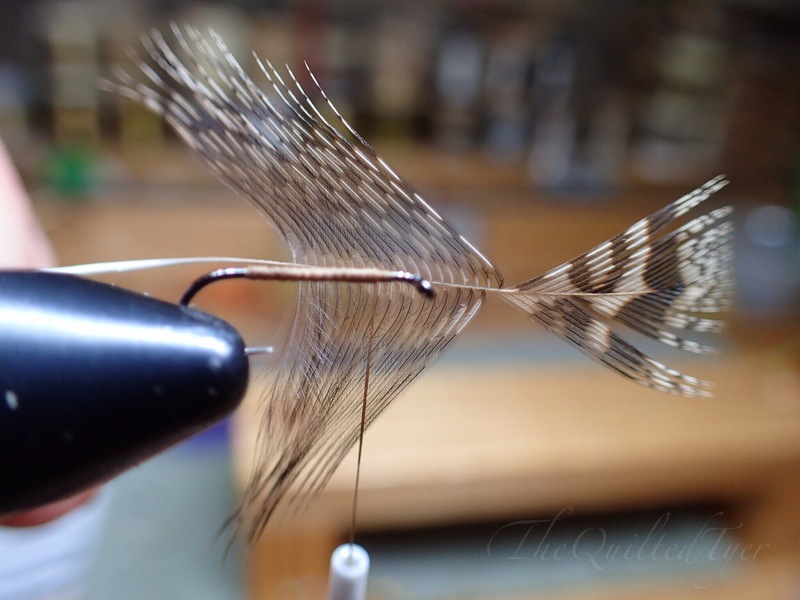 Normally when creating the umbrella on a soft hackle you are wrapping a feather with the exact length fibers that you need to achieve your outcome, and don’t have many adjustments that need to be made. In this case, we are going to recreate that end result in a different way, so that means your next step is so decide how long you want them. The same way we tie most flies, by eyeballing it! So grab that bundle, hold it over the hook shank with the tips pointing over the eye and lets begin. 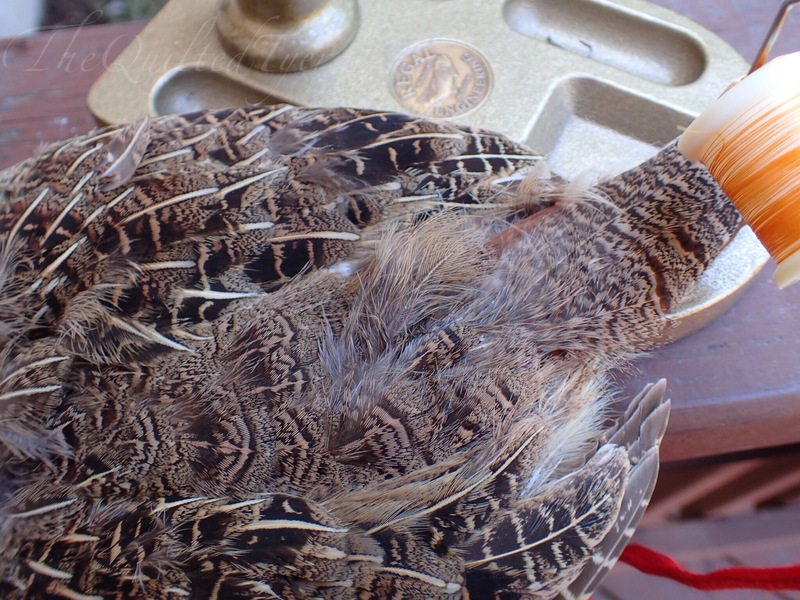 Position the hackle over the hook shank. What you are tying to do here is to get a general idea of where you want those fibers to end one its complete. Lets say you want the fiber tips to end (on the finished fly) where the thread ends across from the hook barb right now. In that case you just need to hold the fibers over the hook shank, aligns the tips a little bit over the eye (to make up for the lost space when bending them back) and then grab the base of the fibers where you want them to end. Then just hold on to it all, lift and bring it to the eye. Think of this as tying in tailing in reverse! Wiggle some of the fibers down over the shank. Wiggle those fibers a little as you bring it to the eye. Once you have brought the entire bundle right behind the eye, take one wrap to secure it. Take one tight pinch wrap and let go. Don’t let go of that thread, just take one wrap, hold it tight and let the bundle go so that you can give it a once over. What you are trying to achieve is having the fibers land above and below the hook at the same time. Got it? Does yours look like this below? Are the fibers are only on one side? Have no fear, we can fix this! If you’d like to re align the fibers, just grab the bundle same way you did before, as if you were tying it in; and then UNDO that last wrap. That’s right, hold the fibers, unwrap it. Once you have done that, simply wiggle the bundle carefully between your two fingers as you push it down along the sides of the shank, staying bedingthe eye. 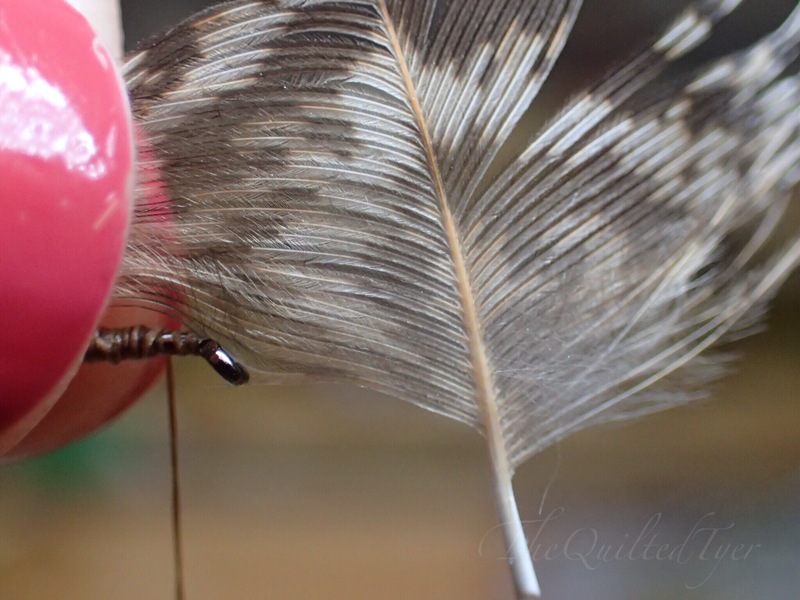 Doing this will re-position the feathers so that they land under and on the sides of the hook. Now all you need to, do is to take that one wrap again and see if you like it now. This reverse umbrella effect above is what you are trying to achieve, but if it isn’t working right away and you aren’t liking your end result, try again. The never ending learning process that comes with fly tying is what makes it so interesting and rewarding, so don’t quit just yet! 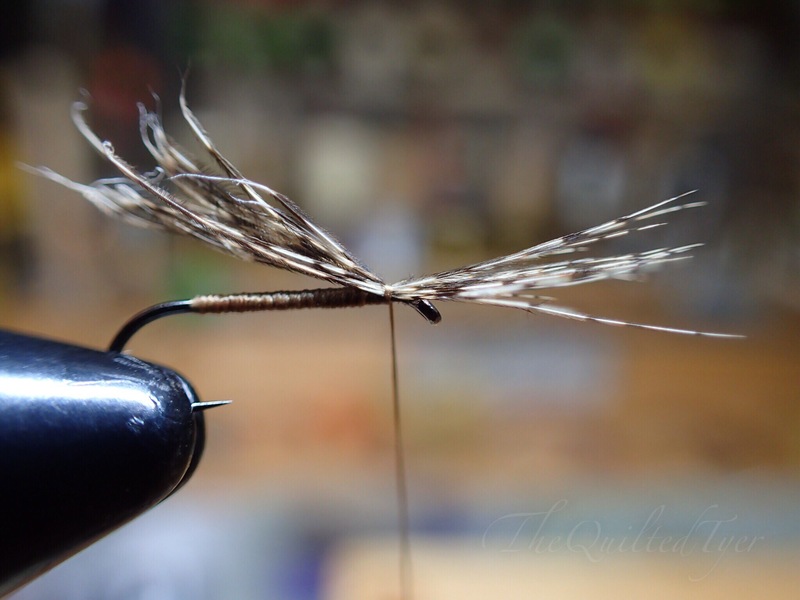 For arguments sake, Lets say you are trying to tie a partridge and orange; well, now that your “too long hackle is tied in just right” you would wrap over that excess fiber to the back, bring your floss to the front, ect. ect. tie it how you want, tie it off, stop behind the feather and THEN continue this step-by-step from here. Now its time to practice bringing that hackle back towards the hook shank. I’m doing this for demonstration purposes only so at this point you can either wrap over that excess to create a uniform body or just cut it off. Maybe, maybe not. It depends on your pressure, thread wraps, current skill, feather fiber strength, ect. Dubbing! That’s right, a little ball of dubbing is all you need to prop these hackles up. Which is why this technique is great for a partridge and yellow, snipe and purple ect. 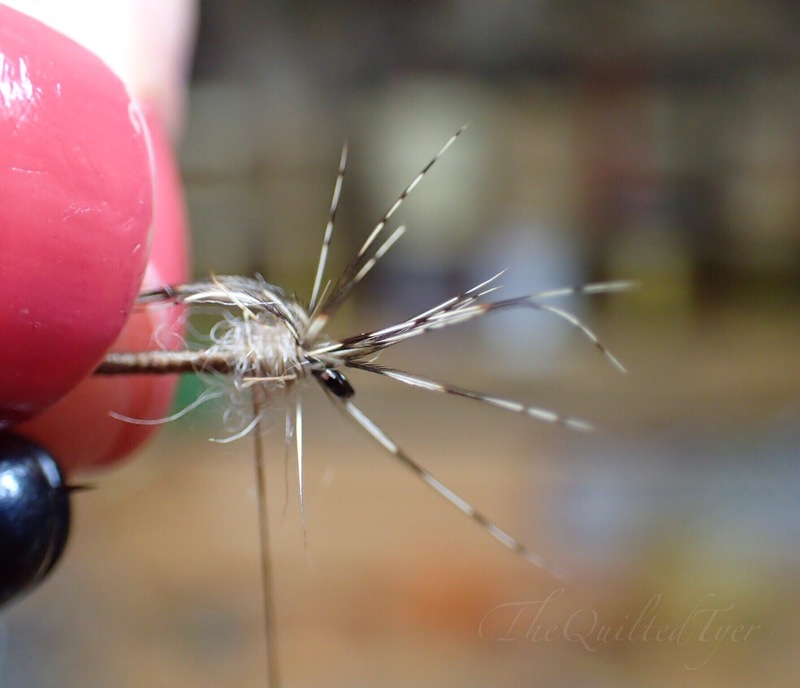 Bring that thread to the front of the dubbing and get ready to preen those fibers back. Gently grab the forward facing fibers and begin to pull them back towards the shank. Once you have done that, bring your thread to the front and take one or two turns in front of the hackle before letting go. Stop right here, hold that thread tight and take a look at what you have on your hook. Are the feathers splayed all around the eye in a nice umbrella? Does it look like the photo below? If your fly now looks like this, simply place two fingers over the hook shank and wiggle that hackle along the sides of the shank. You are now going to do the same little maneuver that you did before , when the fibers weren’t where you wanted them at the tie in point. 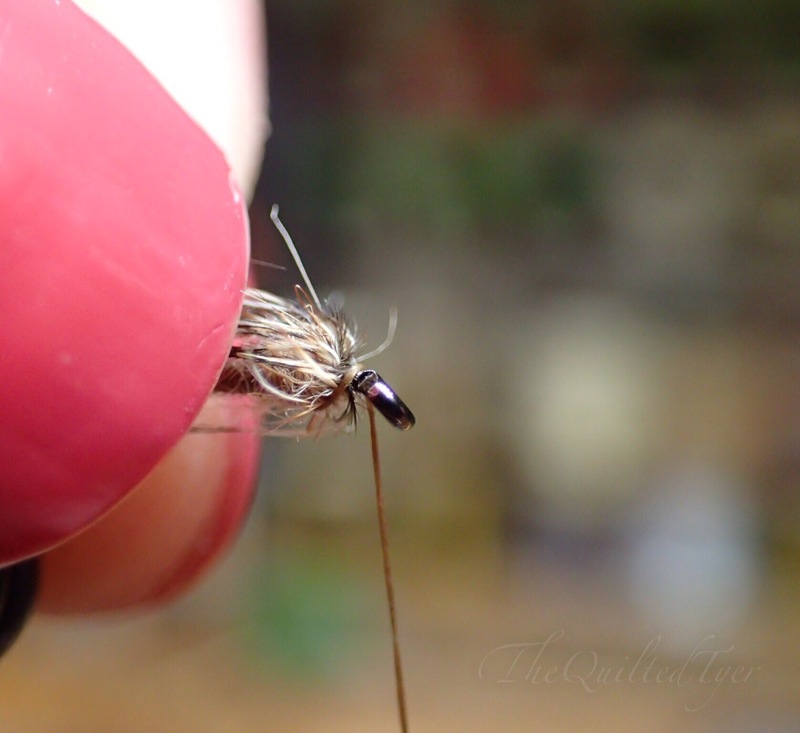 You are going to use your two fingers to wiggle the fibers a little bit on either side of the shank. Give it a try! If you still have trouble, try loosening up on the thread hold just a tinyyyyy bit by letting a little slack into the bobbin. Now just create a head, and cut your thread. All finished! Keep practicing and it will eventually become second nature to to. 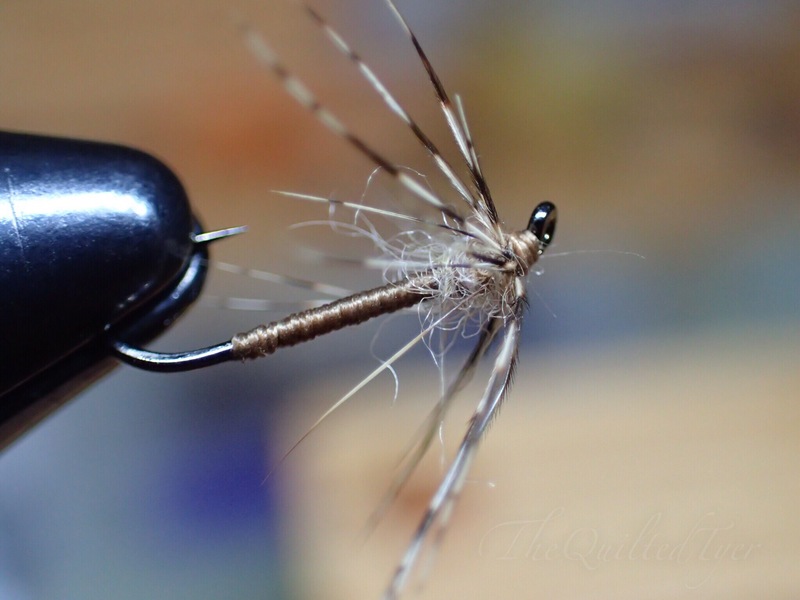 This next technique is great for a fly thats done.. but not done enough. 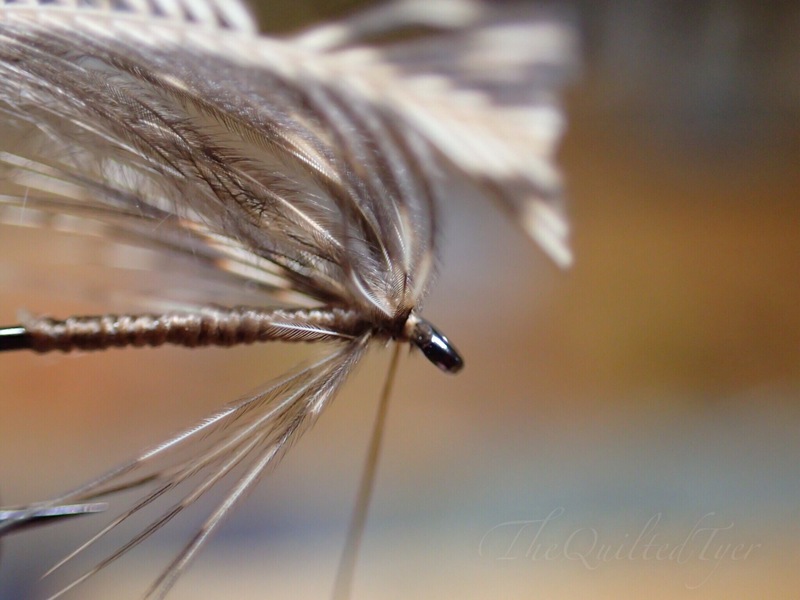 Imagine your fly is almost finished and its time for the hackle collar. But you realize that you cant, because you don’t have the right size feather, they are all too big! First you need to decide if the feather you have grabbed is right for you. You are going to grab that feather and once again hold those usable fibers horizontal over the hook shank. See if the tips will align. Id so, grab them, and trim top and bottom so that you can handle it better, Just do this by cutting the stem and tip off. 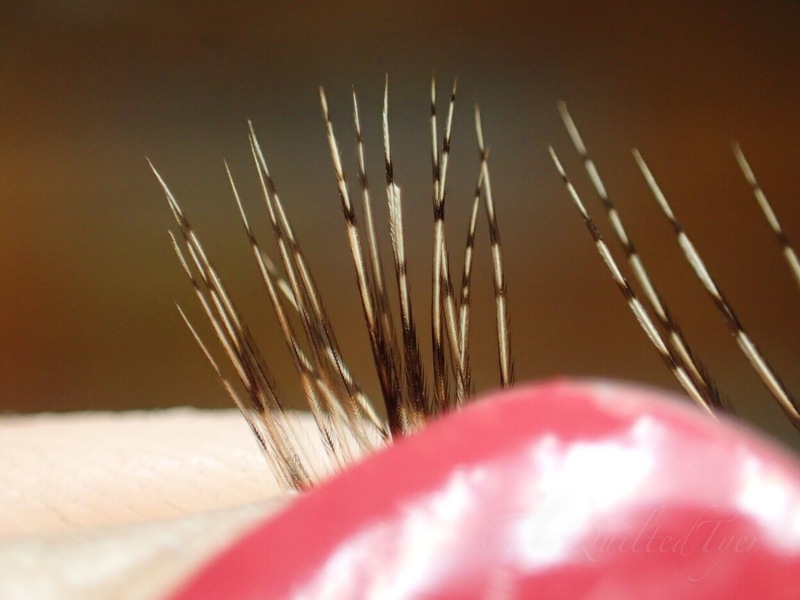 Once you have decided that this oversized feather has enough hackle, I recommend grabbing the usable area and trimming the top and the bottom so that you can handle it easier. But wait! Take a look above once more! See the untouched side? That’s still good, that means that you will have the entire other side of that feather to use, so don’t throw it out when you are done. Just flip it around and do it again on the next fly! Earlier we tied the fibers in over the hook eye, now we are going to tie them in over the hook shank. 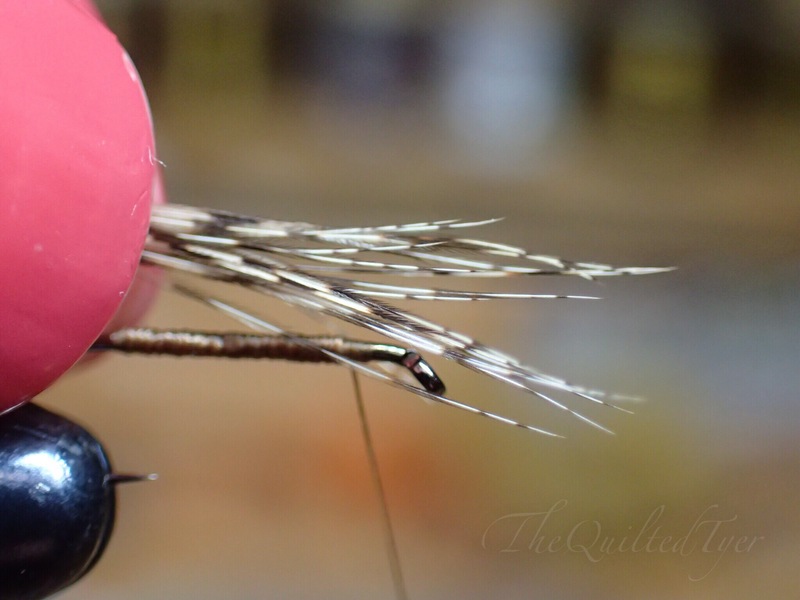 While holding the fibers over the hook shank, take a look at where you want them to land. 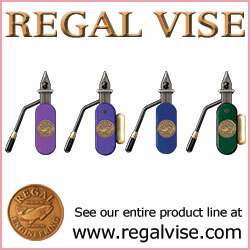 Adjust them to the length that you like by simply moving up or down the shank, until you agree with the placement. Where ever those tips are hovering, is approximately where they will land when they are tied in. Once you are happy with the tip placement all you need to do is to grab those fibers right at the TIE in point. That’s right, this is a little different than before. This means that when you hover the fibers over the hook shank and decide how long the hackle needs to be, hold it steady.. and move your eyes to where the tie in point is going to be right behind the eye. Once you see it? Grab it! Hook shank and all. You should now be in the below position. Find tie in placement, then grab the fibers and hook shank all at once right behind the tie in position. To about halfway through the fibers top and bottom of the stem. 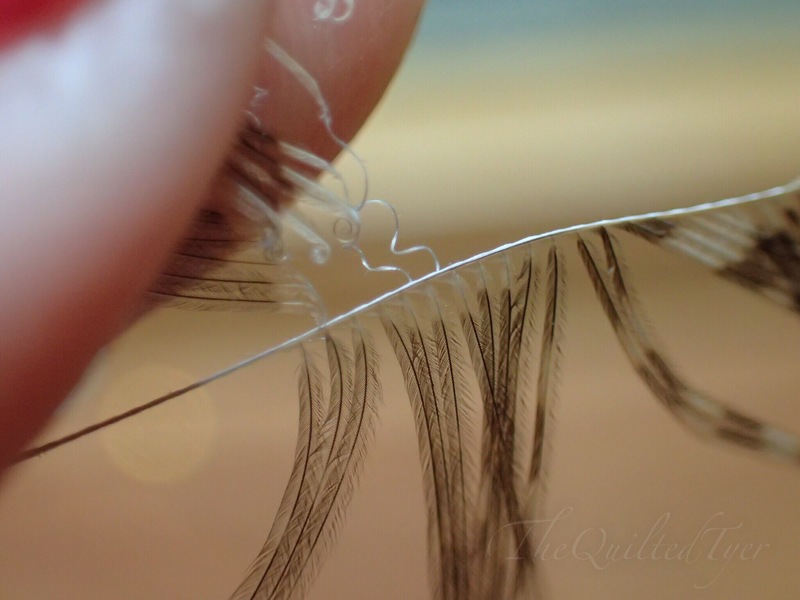 Bring the feather down so that the eye lands halfway between the top and bottom fibers. 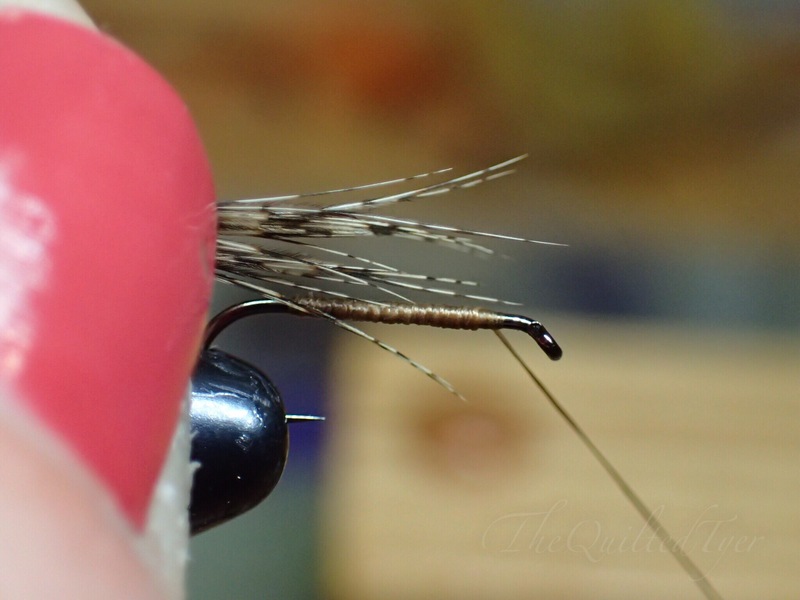 What you have done here, is pushed the eye of the hook through the middle of the hackle so that when you take a wrap, it should splay them out for you around the hook. Now let go to see how it landed! Be sure to keep that thread tight, and if you don’t like how it looks, its ok! Just undo that one wrap and do it over. The fibers are still attached to the stem so you can easily try again. Or, again you can use your two fingers on either side of the hook shank to wiggle the fibers a little like earlier. Once you like the placement of the umbrella, its time to tie off that material. Once you like the placement.. you wouldn’t believe this.. but you are all done! 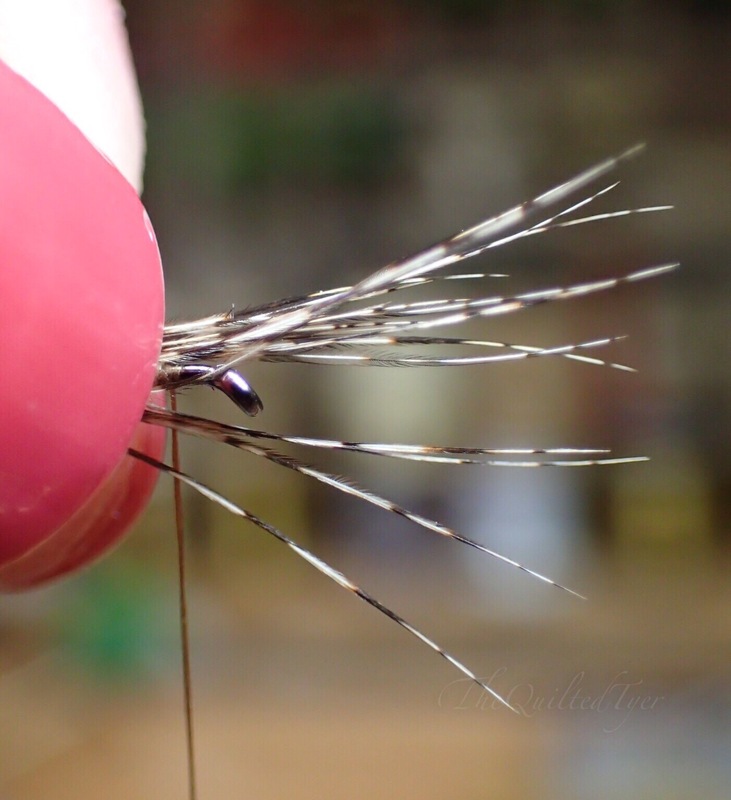 Seeing as though this technique is something i use on a FINISHED fly, Thats it! 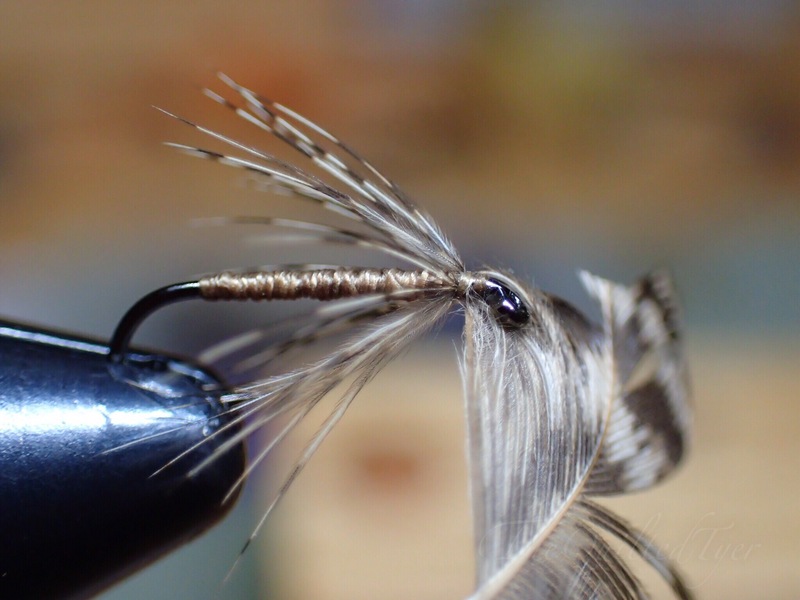 There is no wrapping of the hackle, only tying it off, trimming the excess and creating a head. 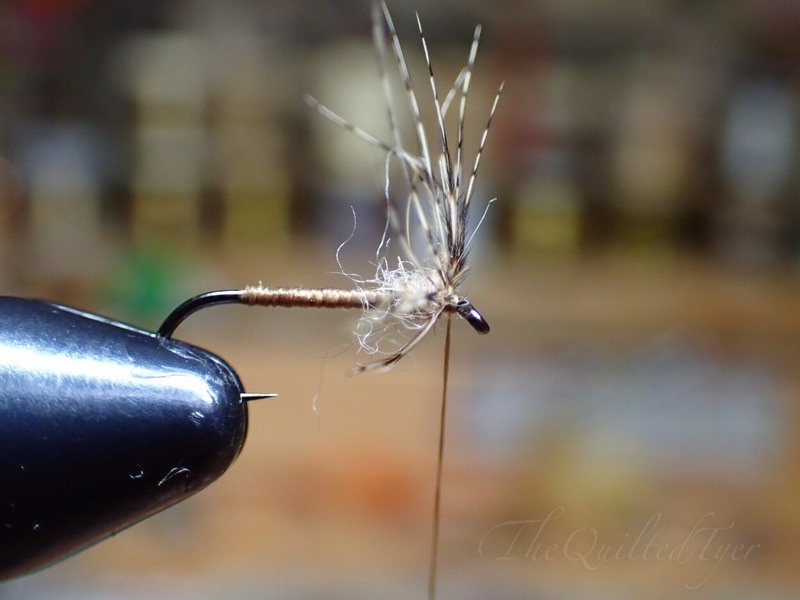 Also keep in mind this is meant for a finished fly, but I am showing it to you as a standalone technique. 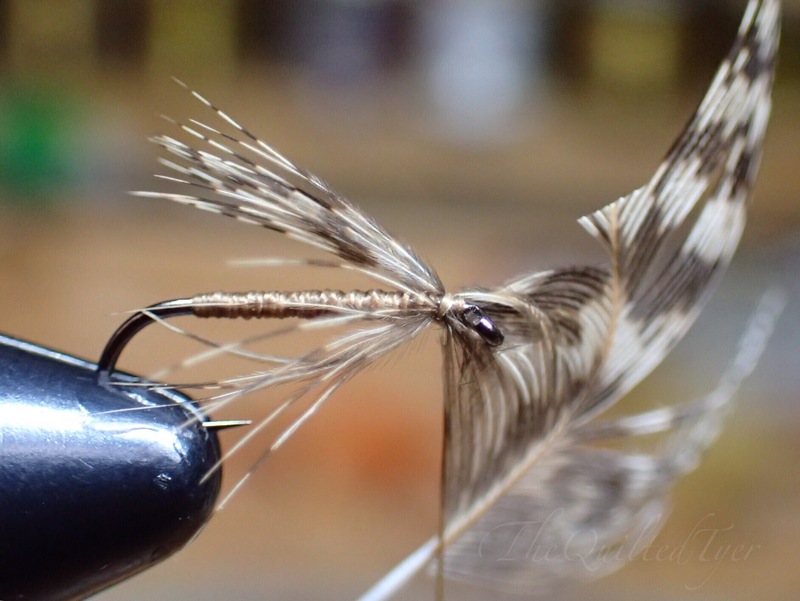 Normally that hackle will be propped up more around the thorax of whatever pattern you are tying, just like in the photos above. 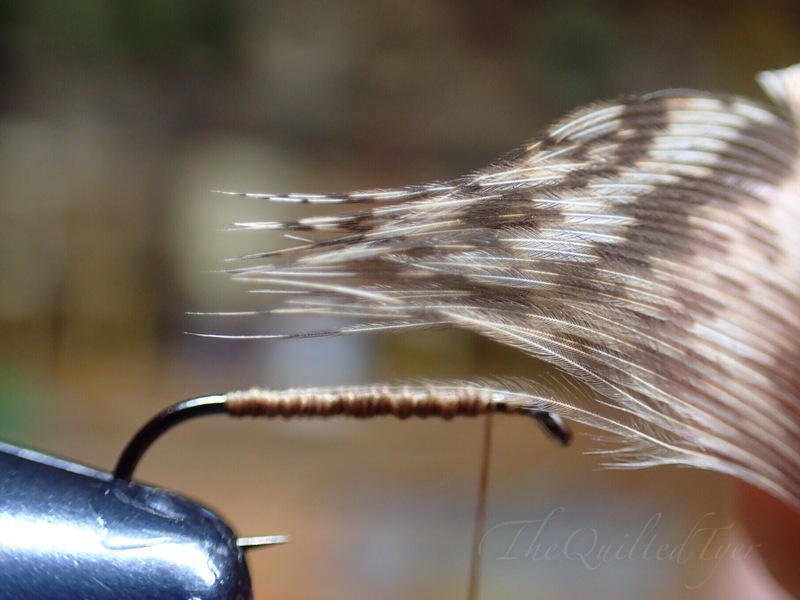 If you were to clip this hackle just where it lands and tie it off, you will crowd the hook eye. 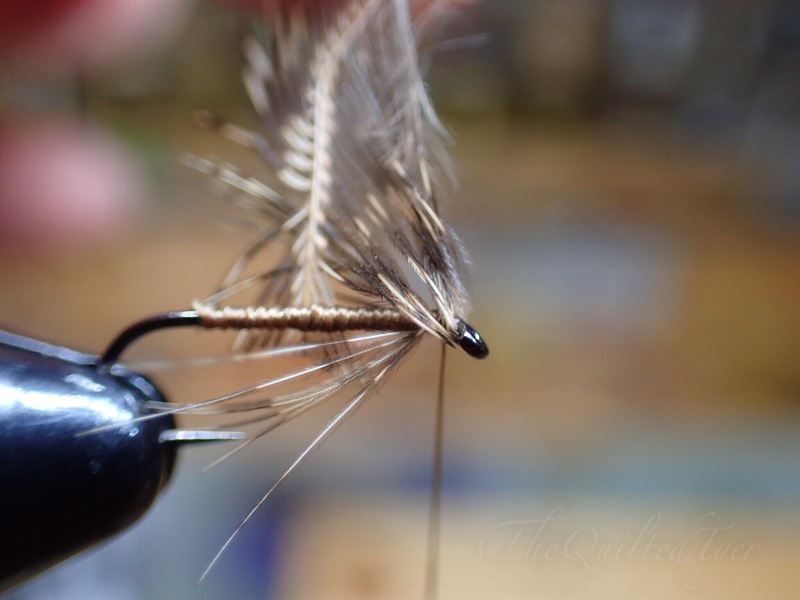 I recommend keeping pressure on the fly with the thread, and lifting the feather UP AND BACK, then taking a few turns in front of it before snipping off the excess and creating a head. Bring the Feather up, and take a few wraps in the front right behind the hook eye. Take a few turns before snipping it off and creating the head. Remember, the best way to do this is to keep tension on the thread while bringing that feather UP and BACK. Not half bad for half the hackle! These are far from the only ways to do this, and in future posts I will go over more. These are just the two that I use the most, for two of the most common situations. 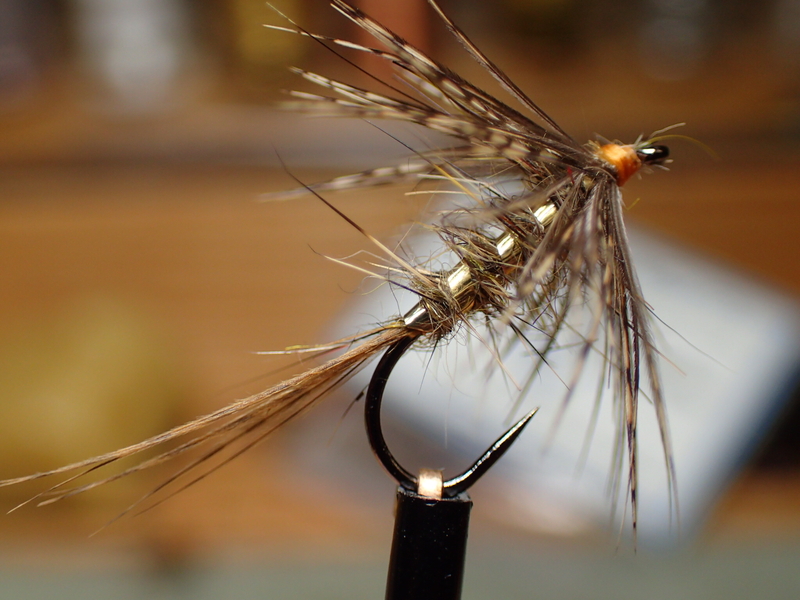 A bare hook, or a finished fly. Both needing that hackle to be shortened. Like I said before, soft hackles don’t fish any worse as they get a beat up, they tend to fish better. 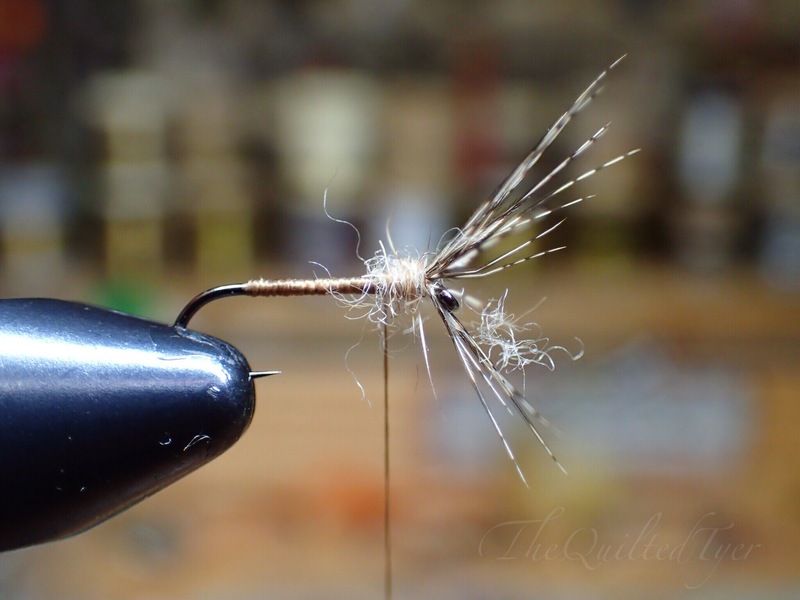 Which is why I wouldn’t rule out tying something just because you don’t have the exact size feather that you need, use what you have and make it work! I hope this tutorial has helped you pull some of those feathers out of that scrap bin. As always, please comment with any questions, I will do my best to help!